Wendie's Wanderings: And heeeerrrrrrrr's who? Take a look to the right there. My Illustrator, Paige Billin-Frye is holding our latest book -- THE HALLOWEEN BOOK OF FACTS AND FUN. One of the chapters in it discusses other festivals celebrated around the time of Halloween. And one of those festivals is the Day of the Dead. 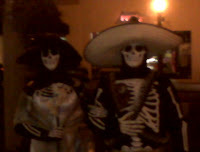 The picture at the beginning of this blog message today is that of the person who gave me a lot of information about how the Day of the Dead is celebrated in California. He and his wife dressed as Day of the Dead figures for last year's Halloween party. Talk about mixing two cultures. Very creepy picture! My daughter learned about Day of the Dead in school this year and brought home an art project. They made skeleton figures--hers was a ballerina. Unfortunately, this was a picture taken by a cell phone camera. A bit dark and blurry. They say they have lots better pictures of their costumes on their real camera, but haven't organized them, yet. Yes, Day of the Dead skeletons are supposed to be happy creatures enjoying what the dead liked to do best -- your daughter's choice of ballerina was perfect! I love it! Fun, Wendie. Day of the Dead figurines in some ways creep me out a little, but in other ways, I love the idea of the dead getting to have some fun, too!